Well, who would have thunk it? I’ve always known Rives as a performance poet, but tonight, as I was searching around the Web for something to share with you here, I discovered that he is also a paper engineer. He’s very passionate about his craft – you’ve just got the check out the Advent calendar paper cube to see the brilliance in his art. I have to admit to a fondness for clever paper craft like that, where someone’s workmanship surprises you with hidden layers. I would have spent hours playing with that as a child had I been fortunate enough to have something like that. For those of you who have never seen Rives’ performance work, we’ll revisit ‘Is 4am the new midnight‘, where Rives waxes his lyrical origami this time. No time for lyrical origami for me tonight. The lure of sleep is strong, after another frantic week of work. I would be so pleased if my to do list had shrunk this week, but I think I’ll be looking at the same list and adding to it on Monday. Hopefully the weekend ahead will provide a slower pace and I’ll feel a little more in control when I next walk through the doors of my employ. How do you prepare for a TEDx talk? 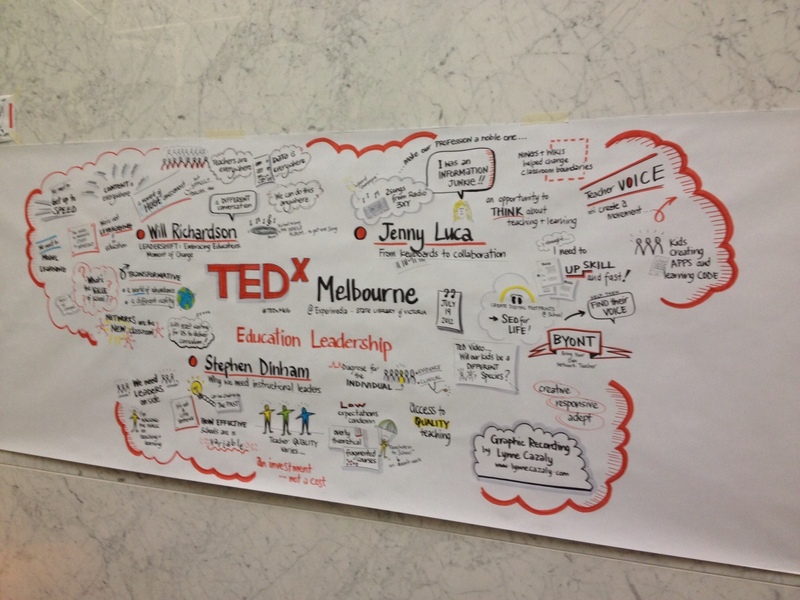 Last month, I delivered a talk at TEDxMelbourne: Education Leadership. 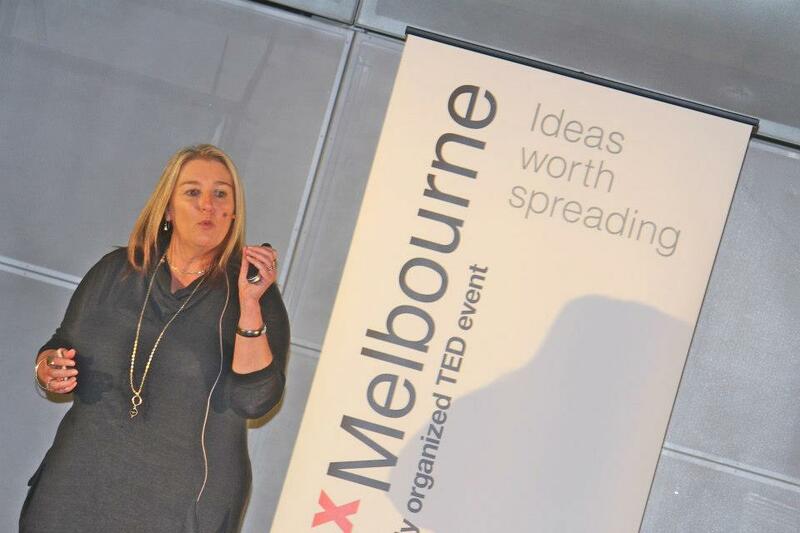 It should be online in the next week or two at the TEDxMelbourne YouTube channel, so you can make your mind up then as to what you think about it. I haven’t spoken about it at length here, but I thought it might be an interesting exercise to analyse the process I went through putting a talk like that together. It may help anyone who is asked to do something similar. First up, there are time restrictions on your talk. 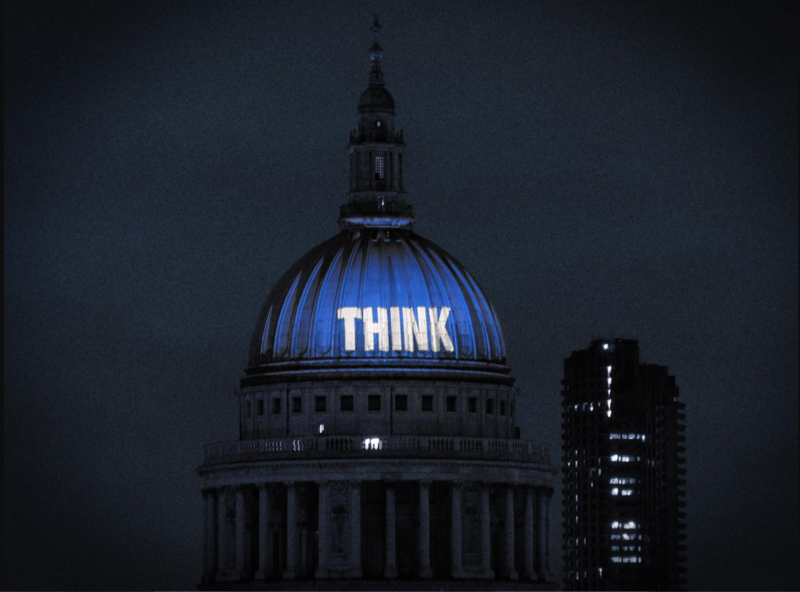 The premise of a TEDx talk is to present an idea worth spreading in 18 minutes or less. I’ve watched my fair share of TED talks and know that the ones that grab my attention are often those that have a thread of a story running through them. When I first started presenting, I found the work of Garr Reynolds invaluable. Garr speaks often of the need to tell a story when you are presenting and I try my best to do that using techniques he recommends for slides that accompany my talks. So, I knew I needed a story thread that could run through my talk and bind it together. Once I had my idea, I then needed to put pen to paper, or fingers to keyboard to be more accurate. I use Evernote for most of my notetaking now, so I set up a folder and started jotting down ideas as they came to me. I’m not sure if this is true for everyone who delivers a talk like this, but for me, it occupied much of my available thinking time in the weeks leading up to it. My thinking time is often restricted to moments of solitude, and they are not all that frequent in my busy life. Some of my best ideas come to me while getting ready for work in the morning, when everyone else is asleep and there’s nothing that can distract me. I had to take to having my iPad or phone close by at all times so that I could jot down lines on the fly. Some of the key ideas came while I was standing under a hot shower; I’d have to repeat them over until I could grab the iPad and record them for posterity. I’m used to using a slide deck to guide my presentations. I don’t use notes when I present; I have my ideas running through my head and the impetus for the next idea is prompted by the next slide in the deck. I’m used to presentations of an hour or so in length, and know that I have room to ad lib or embellish, or speed the presentation along if I’m running out of time. A TEDx talk is very different given the time restrictions. I was also pretty conscious that it was going to be filmed and I didn’t want my speech to be sloppy or to fall into habits that I know I have when I’m speaking in front of a group. I tend to say, ‘you know’ and sometimes lazily abbreviate words eg: say ‘gonna’ instead of ‘going to’. I’d reconciled that notes weren’t going to suffice; I was going to need to write this out as a speech. My dilemma was finding time to write. In the lead up to this talk, I had an ISTE presentation and a Keynote to prepare, as well as marking and end of semester reports to write. I resolved that the fourteen hour flight to Los Angeles was going to be writing time for this talk. I needed to go into airplane mode where no other distractions were going to interfere with the writing process. It worked. I wrote the bulk of the talk on my iPad on the flight over inside the Evernote app. I found myself dozing on the flight and dreaming my way through the talk. On more than one occasion, lines that I used on the final talk were ones that came to me in my sleep; I’d wake and scramble for the iPad, getting them down before they disappeared from consciousness. The flight home gave me an opportunity to look at it closely again, and I polished it further and added new paragraphs on that journey home. Once home, I decided I needed to record myself speaking the talk to time it and see how I went with the 18 minute limit. I used SoundCloud to do this, and shared the track with Jon Yeo and Hamish Curry who were mentoring me for this talk. Their feedback was invaluable, and led to me refining the talk further. I haven’t had to memorise content that has a time limit restriction for a very long time, and I struggled trying to to do this. I’d read it over and over, but it just wasn’t coming naturally to me. One night in the week preceding the talk, I had a minor breakdown and told my family I didn’t think I was going to be able to do it. It was that breakdown that was the catalyst for finding a way through. I pulled myself together, took the speech in hand and wrote it out in point form. I condensed 3000 or so words down into key ideas and lines and started to rely on these to prompt my memory to fill the gaps. This was a major breakthrough – finally it was coming together. An intense rehearsal stage followed. My lounge room became my venue and the blank television screen was my audience. My family found it quite amusing listening to me speak animatedly to no-one for hours on end. I used the stopwatch on my phone to record the length of the talk, but every run through was different. I never delivered the same talk twice. Sometimes I’d be over 18 minutes, and sometimes I’d be under. After a couple of days of this, I had to accept that I might not stay within the 18 minute limit and that I was more than likely to run over. What I came to realise was that, in my mind, it was more important that I impart my message and not get hung up on 30 seconds here or there. The day prior to the talk I realised that I was going to need some palm cards with me as a bit of a crutch to help me on the night. I made four small cards that fit into my palm and I wrote key words for each part of the talk to help prompt me if I stumbled. It gave me peace of mind, and at that stage, I needed it! One of the things I rely on when doing any form of public speaking, be it in a classroom or at a venue, is making a connection with an audience and feeding off their reaction to your words. Not everyone is always with you, but there’s usually some kind of body language from someone that’s encouraging and helps you give out the energy needed. I’d forgotten about the lighting that’s required when you’re being filmed and found myself on stage with spotlights glaring from the sides and an audience of shadowy heads in front of me. I couldn’t for the life of me make out a face and see how the audience were reacting to my words. I could hear laughter at appropriate moments, but couldn’t detect if there were any nodding heads or knowing smiles. It was like I was standing in my loungeroom talking to the blank television! You can be the judge of the success or failure of the talk when it becomes available. I’ve come out of the experience very thankful for having been given the opportunity. It was one of the hardest things I’ve ever done, but one of the most rewarding too. I have new found respect for anyone who has done a TED or TEDx talk, and for those students out there whom we ask to perform oral presentations in our English classes on a regular basis. One of the really cool features of the night was the inclusion of Lynne Cazaly, an artist who drew our talks in graphic form as we spoke. Her work is such a wonderful representation of what was imparted. True Blue Production, who volunteered their services to film on the night, have done a great job of a backstage video of the event. Take a look below. Special thanks from me go to Hamish Curry and Jon Yeo. Thanks for the great mentoring and the opportunity. I am very grateful. I dare you to watch this and not be moved. Sure, it’s an ad from the one of the biggest companies in the world who really know how to market themselves cleverly, but put that aside for one moment. Is that guy who jumps off his motorbike to move that vehicle out of the way of a moving train not one of the world’s unsung heroes? And what about the other guy who risks life and limb for that runaway dog? Not to mention all those workers going about their daily jobs injecting an element of humour into their day and making what may be menial jobs worthwhile. One day, I want to be one of those music addicts dancing like no-one’s watching in the streets. Just imagine how much fun that really would be. In the meantime, I’ll amuse myself by attending my son’s school’s trivia night tonight. There, I will astound people with my lightening fast responses to cartoon theme songs and questions asking who wrote that science fiction classic from 1956 that nobody else read. Yes, there does come a time my friends, when the terabytes of seemingly useless information stored in my brain cavity come into good use. I will venture forth, knowing that tonight, I have purpose! So says John Green. Don’t take my word for it. Take a look. This is John Green’s, ‘An Open Letter to Students Returning to School’, one of his Vlogbrothers entries posted on YouTube. It was my opener for my Year 10 English students today, and it sparked plenty of healthy discussion about what we should be teaching in our classrooms, and what are the skills young people are going to need to be successful in their future lives. After this vibrant, healthy discussion, we had to pick up Shakespeare’s Romeo and Juliet, something John Green would probably consider a waste of time, since Baz Lurhmann has done a pretty good filmic interpretation of it! What I especially loved about this video was his parting message, that schooling is about me – you need to watch it through to see John’s intent. My kids liked it to. I think it made them reflect, for a moment, about school’s higher purpose, about why they are sitting in rooms learning about Physics, Biology and English. At the end of the video, John suggests viewers go and visit Crash Course, the YouTube channel he and his brother Hank are developing to support the teaching of Biology and World History. Take a look at John’s treatment of World History (the videos are on a playlist and scroll through) – I think they might keep some of our students a tad more interested than some of the educational videos I’ve seen in the past! I haven’t used a Hamish and Andy clip for quite some time, and it’s a pleasure to share Hitch-Hike Racing with you today. My husband doesn’t share my love of Hamish and Andy, but they always make me smile with their take on life. Hopefully you’ll enjoy the battle that is Hitch-Hike Racing and hang in there for the fourteen minutes until the victor is revealed. Are we learning from Lady Gaga and Troy Carter? You don’t have to like her music, you don’t have to like her fashion sense, but you do have to have some admiration for the way she conducts business. For several years, Carter has been plotting a digital disruption of the music business and, by extension, the whole entertainment industry. In addition to his offices in Los Angeles, which employ talent managers and communications and support staff, he has a team of nearly 20 engineers and executives in Palo Alto, working seven days a week developing something called the Backplane, a social-media platform that will allow celebrities to combine all the elements of their social-web presence. The Backplane team is creating a new type of social corridor. We believe that audiences seek new and more meaningful ways to connect and engage with each other. Backplane fills a gap in the current social spectrum by empowering sharing and conversation that is effortless but not automatic. They needed a chat function. That was already in the works; the Backplane was using Google’s translation software so people from all over the world could chat in one language. There is much to learn from Troy Carter and his vision. This kind of entrepreneurial thinking needs to emanate from somewhere. Troy grew up in a rough neighbourhood in West Philadelphia and got some breaks that found him working with Will Smith. His willingness to do pretty much anything that was required led to other job opportunities. He even went bankrupt at one stage, but eventually found himself introduced to Lady Gaga. Me, I’d like to know more about his schooling. Was he introduced to creative thinking in the classrooms he occupied? Was he inspired by someone in his youth who saw something in him and encouraged this kind of willingness to take risks and think outside the square? What are the implications of this new approach to shaping and growing a career for education? Plenty, in my book. We need to be exploring this new business model in our classrooms and make sure our students have a keen understanding of the benefits of utilising social media to create your brand and proactively develop employment opportunities. Schools themselves can learn plenty from this. How many are utilising the tools of social media to communicate with their communities and grow their brand in a positive, proactive fashion? Take note too of the job industry driving this change. If you take a look at the jobs board on the Backplane site, you’ll see that coders are in hot demand. If we’re going to see the Web become the vehicle for dissemination of not only ideas, but content, then we’re going to need a skilled workforce to meet the demand that is sure to ensue. The Khan Academy are about to release an education portal that teaches Computer Science fundamentals through interactive drawing. But let’s not rely on the self motivated to fill the positions that will arise. Let’s open up kids’ eyes by teaching the elements of coding in our schools and educating them about the career prospects that await them if they choose to master it. Another lesson here also for the book industry. Publishers, are you taking note? Because I bet authors are. We’ve already seen J.K Rowling begin to control her ownership and distribution of content with Pottermore. I’m guessing there are quite a few high profile authors, and low profile ones too, who would be interested in Backplane and the possibilities there for controlling their content and profit margins. Changing times call for changing approaches across many sectors. Lady Gaga and the team behind her are people to watch. You can learn more about Troy Carter’s background and his approach to the music business by watching this Keynote interview from the Music Matters conference in June 2012. Have you had your fill of serious sport after a couple of weeks of the Olympic Games? Looking for a participation sport that can involve anyone without the prerequisite of being an ultra fit athlete? Then look no further than the latest MP3 experiment from the Improv Everywhere crew. Here, 4000 participants converged on Governer’s island in New York City to follow out instructions fed to them via a dowmloaded MP3 file they were listening to through earbuds. It looks like a tonne of fun. Look out for the Hextacopter drone that is used to take the aerial views – very interesting. The sheer bliss of a weekend awaits. Not much on my agenda, other than the requisite work required for school and the never ending cycle of housework. If the weather cooperates, I just might venture down to the local beach where I’ll store some energy for the week ahead from the sea.